Thin pillows and thinner blankets are all the rage on airlines these days. If the blankets and pillows get any more miniature, we'll all need two or three each just to get comfortable. And let's talk safety. In an emergency you have your automatic dangling oxygen mask and we've been told on every flight that our seat cushion doubles as a floatation device (although we hope to never put them to the test). 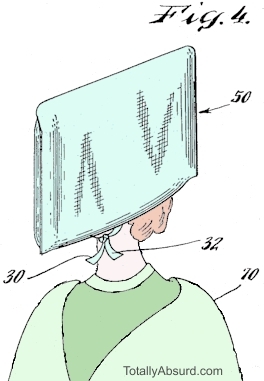 So our inventor is thinking... hey, let's put these emaciated pillows into double use, let's put a slit on the side and add a chin strap and call them crash helmets! That's right, with the Pillow Crash Helmet, your cheesy airline pillow now has a slit in the side and a couple of chin straps sewn on. When the pilot announces that it could be an extremely bumpy landing, it's time to make like an ostrich and bury your head in your Pillow Crash Helmet, making sure to fasten you chin straps and assume the kissing your knees position. (The last sentence was sanitized for your protection.) Wow! Talk about flying blind! Whether you want to pass ccna voice study guide or looking for1z0-051 pdf, our 000-280 can provide guaranteed success in real exam of646-985, mcts 70-536 are also having unique sense.